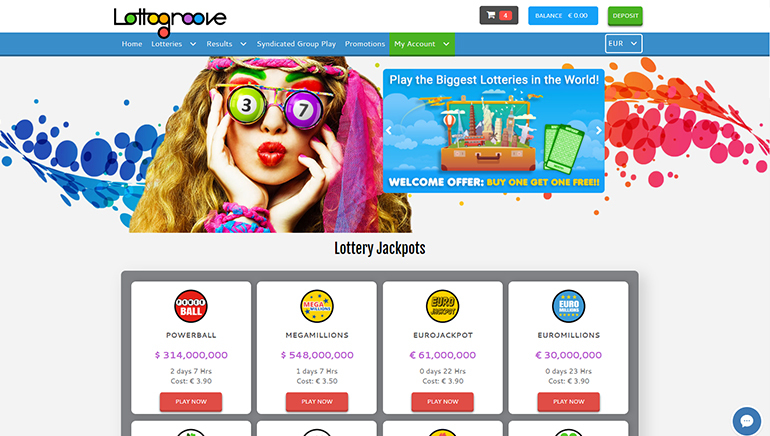 LottoGroove is a groovy online lottery ticket agent, catering to South African players. This company is fully owned and operated by Kingsman N.V., and licensed by the Government of Curaçao to offer lottery services to players. This gaming provider is 18+ compliant, SSL secure, and a firm adherent of responsible gaming practices. Players can easily get started with the biggest lotteries in the world at LottoGroove. These include the Powerball, MegaMillions, EuroJackpot, and scores of others. LottoGroove also offers players the option of syndicated group play where they can increase their chances of winning a payout by joining a syndicate. This lottery betting site facilitates lottery ticket sales for all of the world's premier lotteries. It is guaranteed safe and secure, and players are not required to frequent lottery ticket agents to buy their tickets. Once clients register on-site, it is easy to make lottery selections on any of the listed lottery draws. Lottery betting is available on the premier lottery draws where players can place a bet on the results of a lottery. They do this by selecting numbers and then paying the price for the wager. If the numbers match the lottery results, payments will be made – much the same as choosing the right numbers in a lottery. Players who prefer group play will enjoy the syndicated group play option available through LottoGroove. This option requires a group of players to purchase multiple tickets and share the costs of playing the lottery. As the number of tickets purchased increases, so too do players' chances of winning. 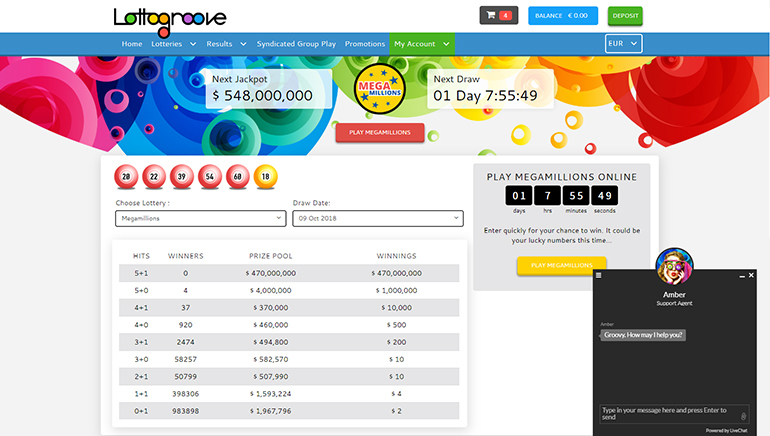 The tickets are not purchased by players in person – they are purchased by lottery ticket agents from LottoGroove and then saved to players’ accounts. Syndicated play is simply a lottery pool, and anyone in the pool is entitled to winnings that accrue. Players don't need to worry about finding other players to join a pool since this is LottoGroove’s job. Which lottery games are available? 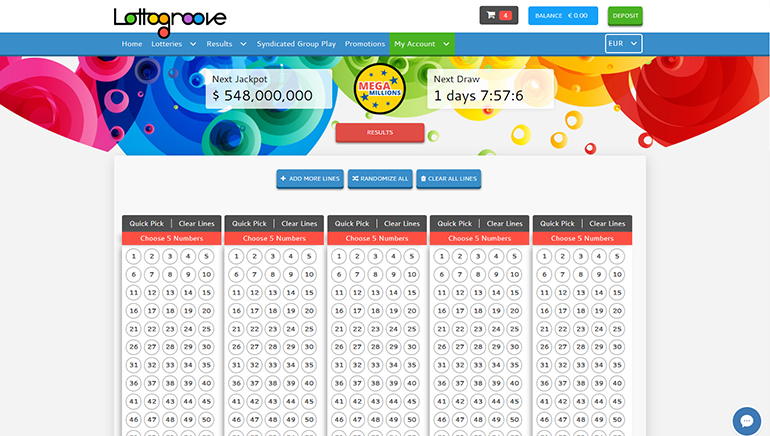 LottoGroove offers players multiple lottery games including Florida Lotto, EuroMillions, California Super Lotto, Irish Lotto, Powerball, Lotto 6/49, and El Gordo Primitiva among others. By clicking the red play now button on the respective lottery draws, players will be redirected to the actual lottery tickets where they can select numbers, choose a quick pick option, or simply randomise their selection. Special benefits are available to players such as free tickets, or discounted prices. The lottery games and results are updated in real time to reflect the time until the next jackpot, and the amount players stand to win. At the time of writing, 16 lottery games were supported at LottoGroove. LottoGroove offers electronic funds transfers/wire transfers, Visa and MasterCard deposit options. These are safe and secure, and all transactions are posted in euros. However, players can also choose from other currencies including the Australian dollar, South African rand, US dollar, and British pound. Customer support is available through an online contact form, email, or telephone. Telephone assistance is available between 7 AM and 4 PM GMT. Customer service agents are helpful and knowledgeable about registration, technical issues, banking, and lottery games. The help/FAQ page is a useful resource for getting started, playing the lotto, and for technical queries. All manner of questions are addressed with concise answers.